At Bayside Kids Dental, we understand your busy schedule—between soccer practice, grocery shopping, and PTA meetings—it can be hard to get everyone in for their regular dental check-ups. We also understand the importance of regular dental care if you wish to avoid tears and more serious dental problems later. That’s why we’re happy to provide all your kids’ dental needs conveniently under one roof. Our practice was designed by kids, for kids! (Just kidding, we designed it ourselves, but it was designed with kids in mind!) You never know, they might even look forward to coming back! You know that old saying, “Prevention is the best medicine”—well, it’s true! It’s much easier to take small preventive measures daily than it is to treat and reverse serious problems once they’ve already happened. That’s why we practice a preventive model of dentistry at Bayside Kids Dental. We encourage you to bring your kiddos in when their first tooth emerges and continue bringing them in for regular exams and cleanings twice every year, so we can catch small problems before they progress. You’ll save yourself and your kiddo a whole lot of pain, tears, money, and time in the dental chair in the long run! Not to mention, healthy baby teeth set the stage for healthy adult teeth, so quality pediatric care will encourage a lifetime of happy, healthy smiles! Keeping baby teeth clean and healthy is our mission, but kids’ teeth are prone to decay because they lack the knowledge and dexterity to properly care for them. We do our best to provide thorough education and training, but we can only do so much! Sometimes things happen, and that’s ok—that’s what we’re here for! Whether your little one needs to have a cavity filled (or a couple), has an infected tooth, or broke a tooth, we can help restore their smile back to its full, healthy, and adorable condition. We offer durable and natural-looking tooth-colored fillings, crowns, and root canals to treat whatever issue they may have and get them smiling again in no time! We don’t like to put too much emphasis on aesthetics when it comes to kids’ smiles—for obvious reasons. We believe every child’s smile is beautiful in its own unique way and they shouldn’t feel ashamed or embarrassed if theirs isn’t perfect. Baby teeth aren’t permanent, anyway! However, if there is a serious issue that is affecting the child’s smile and self-esteem, it might be worth considering a solution, especially for permanent teeth. Maybe their teeth have been badly stained by medication, or maybe their teeth are chipped, broken, or gapped. Whatever the problem, we’re sure to have a solution that will have them smiling from ear to ear. At Bayside Kids Dental, we know the dentist can be a scary place for kids. That’s why we do everything we can to ensure their comfort, including the use of a topical anesthetic as well as nitrous oxide and oral sedation options. Sedation can put them in a happy, relaxed state to make getting the care they need easy. In some cases, sedation can even eliminate their fears of the dentist, so they don’t have to carry that around with them for life. Sedation can make for easy-peasy, fear- and tear-free dental visits whether it’s a routine cleaning or a more extensive treatment. If they don’t suffer from dental fear or anxiety, but they have trouble receiving dental care for any other reason, sedation is a wonderful tool we can use to help kids get the care they need, comfortably. Our primary goal is to keep their baby teeth healthy until they fall out on their own and are replaced with permanent teeth. Then, our goal is to keep their permanent teeth healthy—and in their mouth—for life. However, sometimes things happen that are beyond our control, and sometimes an extraction is in their best interest. Maybe they were kicked in the teeth during soccer practice and broke a tooth that’s beyond repair. Maybe they have an infection inside the tooth that’s beyond saving with a root canal. Maybe they have a tooth that’s impacted and unable to erupt. 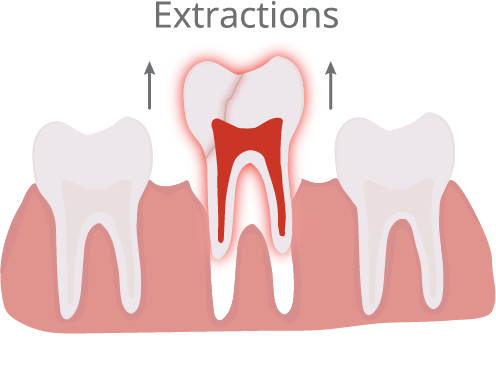 Whatever the reason, we provide safe, routine extractions from the comfort of their regular dental home. Dental injuries can be traumatic—especially for kids!—because they tend to bleed a lot, making the injury appear a lot worse than it actually is. Dental problems like a toothache can also be quite painful and debilitating and should be treated as soon as possible! That’s why we’re happy to provide emergency pediatric dentistry in Odenton—so your kids can get the care they need when they need it. Oral injuries are highly time sensitive, so you shouldn’t wait until tomorrow to call us. That’s why we leave room in our schedule every day to accommodate emergencies and our doctors are on-call after hours in case of emergencies. Just call us and we’ll tell you whether it can wait or if you need to come in right away, and we’ll give you some advice on what to do until you can get in to see us. Check out this Dental Emergency Guide for a list of some common dental emergencies and how to treat them until you can come see us! And be sure to call us right away! If you have any questions about our pediatric dental services or you’re ready to schedule a visit with your Odenton pediatric dentists, Drs. Kenny and Sarrah Zamora at Bayside Kids Dental, give us a call today or request an appointment easily online!